Not to be confused with Mahapurana (Hinduism). Mahapurana (महापुराण) or Trishashthilkshana Mahapurana is a major Jain text composed largely by Acharya Jinasena during the rule of Rashtrakuta ruler Amoghavarsha and completed by his pupil Gunabhadra in the 9th century CE. Mahapurana consists of two parts. The first part is Ādi purāṇa written by Acharya Jinasena. The second part is Uttarapurana which is the section composed by Gunabhadra. The Trishashthilkshana Mahapurana was composed by Jinasena, Gunabhadra and Chavundaraya in 9th century CE. Mahapurana consists of two parts. The first part is Ādi purāṇa written by Acharya Jinasena. The second part is Uttarpurana which is the section composed by Gunabhadra. 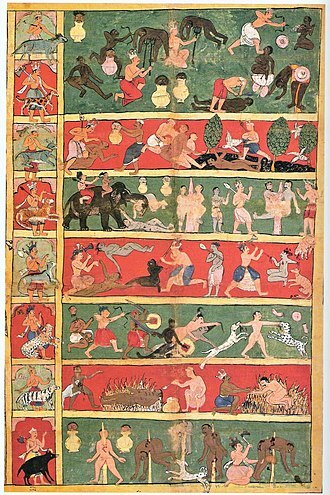 Adipurana contains about 37 chapters where as Uttarapurana contains about 65 chapters. The completed and edited text was released by Lokasena, pupil of Gunabhadra in a celebration at Bankapura in the court of Vira-Bankeyarasa in 898 CE. The first 42 Parvans of this text were written by Jinasena, while remaining 34 Parvans were composed by Gunabhara. Mahapurana is a work of Pushpadanta (Digambara writer) in 960 AD in Apabhramsa. A number of Jain and non-Jain texts have been influenced by the Mahapurana. Mahapurana was the model for Saiva Siddhanta Periyapuranam which gives biographies of the 63 individuals. ^ Upinder Singh 2016, p. 29. ^ Umakant P. Shah 1987, p. 239. ^ "Antiquity Of Jainism". Umich.edu. Retrieved 2012-04-21. ^ Ct12-1 Archived 21 February 2007 at the Wayback Machine. This article related to a book about Jainism is a stub. You can help Wikipedia by expanding it. Amoghavarsha I was a Rashtrakuta emperor, the greatest ruler of the Rashtrakuta dynasty, and one of the great emperors of India. His reign of 64 years is one of the longest precisely dated monarchical reigns on record, many Kannada and Sanskrit scholars prospered during his rule, including the great Indian mathematician Mahaviracharya who wrote Ganita-sara-samgraha, Virasena and Sri Vijaya. Amoghavarsha I was a poet and scholar. He wrote the Kavirajamarga, the earliest extant literary work in Kannada, and Prashnottara Ratnamalika, during his rule he held such titles as Nrupathunga, Veeranarayana and Srivallabha. He moved the Rashtrakuta regal capital from Mayurkhandi in the Bidar district to Manyakheta in the Gulbarga district in the modern Karnataka state and he is said to have built the regal city to match that of Lord Indra. The capital city was planned to include elaborately designed buildings for the royalty using the finest of workmanship, the Arab traveler Sulaiman described Amoghavarsha as one of the four great kings of the world. Sulaiman wrote that Amoghavarsha respected Muslims and that he allowed the construction of mosques in his cities, Amoghavarsha seems to have entertained the highest admiration for the language and culture of the Kannada people as testified to in the text Kavirajamarga. Amoghavarsha I was born in 800 CE in Sribhavan on the banks of the river Narmada during the journey of his father, Emperor Govinda III. This information is available from the Manne inscription of 803 and the Sanjan plates of 871, the Sirur plates further clarify that Amoghavarsha I ascended to the throne in 815 at the age of 14 after the death of his father. All his inscriptions thereafter refer to him as Amoghavarsha I and his guardian during his early years as emperor was his cousin, Karka Suvarnavarsha of the Gujarat branch of the empire. This information comes from the Surat records and the Baroda plates of 835, the first to revolt was the Western Ganga feudatory led by King Shivamara II. In the series of battles followed, Shivamara II was killed in 816. But Amoghavarsha Is commander and confidant, was defeated in Rajaramadu by the next Ganga king, due to the resilience of the Western Gangas, Amoghavarsha I was forced to follow a conciliatory policy. He gave in marriage his daughter, Chandrabbalabbe, to the Western Ganga King Buthuga, more revolts occurred between 818 and 820, but by 821 Amoghavarsha I had overcome all resistance and established a stable kingdom to rule. Vijayaditya II of the Eastern Chalukya family overthrew Bhima Salki, the ruling Rashtrakuta feudatory at Vengi, took possession of the throne and he captured Sthambha, a Rashtrakuta stronghold. From the Cambay and Sangli plates it is known that Amoghavarsha I overwhelmingly defeated the Vengi Chalukyas, the Bagumra records mention a Sea of Chalukyas invading the Ratta kingdom which Amoghavarsha I successfully defended. After these victories he assumed the title Veeranarayana, tranquility was restored temporarily by a marriage between Vijayaditya IIs son, Vishnuvardhana V, and the Ratta princess Shilamahadevi, a sister of Karka of the Gujarat Rashtrakuta branch. Shikharji, Giridih district, India, is located on Parasnath, the highest mountain of the Parasnath Range. 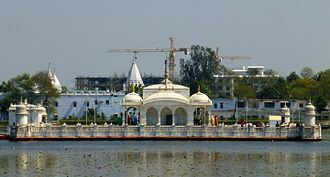 It is a Jain Tirtha believed to be the place where twenty of the twenty-four Jain tirthankaras along with other monks attained Moksha, according to Nirvana Kanda. The site is called Sammed Śikhar or Sammet Shikhar peak of concentration because it is a place where twenty of twenty-four Tirthankaras attained Moksha. The word Parasnath is derived from Parshvanatha, the twenty-third tirthankara, shikarji is located in an inland part of rural east India. It lies on NH-2, the Delhi-Kolkata highway in a called the Grand Trunk road. Shikharji rises to 4,429 feet making it the highest mountain in Jharkhand state, the earliest reference to Shikharji as a tirth is found in the Jñātṛdhārmakātha, one of the twelve core texts of Jainism, at Shikharji, Māllīnātha, the nineteenth tirthankara, practiced samadhi. 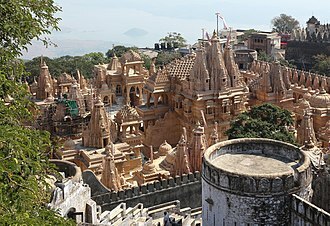 Shikharji is mentioned in the Pārśvanāthacarita, a twelfth century biography of Pārśva, the popularity of Shikharji as a site of pilgrimage followed that of Vulture Peak, where it is believed the Buddhist Sariputta attained enlightenment. Jharkhand acquired Shikharji under the Bihar Land Reforms Act, leaving the rights of Jains in doubt, use of Shikharji as a tourist destination impacts on the religious beliefs of the Jain. Sports such as paragliding and parasailing may take place at Shikharji, the pilgrimage to Shikharji is a round trip of 30 km through the Madhuban forest. The section from Gandharva Nala stream to the summit is the most sacred to Jains, the pilgrimage is made on foot or by a litter or doli carried by a doliwallah along a concrete paved track. Along the track are shrines to each of the twenty four tirthankaras and vendors of tea, water, there is an option for parikrama of the entire Parasnath Hill, a pilgrimage of 54 kilometres. The parikrama path is through the forest and is walking only, the temple at Shikharji is a new construction with some parts dating to the eighteenth century. However, the idol itself is very old, sanskrit inscriptions at the foot of the image date to 1678. At the base of Shikharji is a temple to Bhomiyaji, on the walls of the Jain temple at the village of Madhuban, there is a mural painting depicting all the temples on Parasnath Hill. Paryushana or Daslakshana is the most important annual holy events for Jains and is usually celebrated in August or September. It lasts 8–10 days and is a time when Śrāvakas increase their level of spiritual intensity often using fasting, the five main vows are emphasized during this time. There are no set rules, and followers are encouraged to practice according to their ability, Digambaras refer it as Das Lakshana Dharma while Śvētāmbaras refer to it as Paryushana. The duration of Paryushana is for eight days for Śvētāmbara Jains, the festival ends with the celebration of Kshamavani. 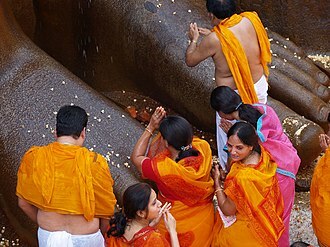 Paryusana means abiding and coming together and it is a time when the Jains take on vows of study and fasting. The Digambara Jains recite the ten chapters of the sacred Jain text, Digambaras celebrate Ananta chaturdashi on which a special worship is done. Many towns have a procession leading to the main Jain temple, anant Chaturdashi marks the day when Lord Vasupujya attained Moksha. At the conclusion of the festival, followers request forgiveness from others for any offenses committed during the last year. Forgiveness is asked by saying Micchami Dukkadam to others, which means, If I have offended you in any way, knowingly or unknowingly, in thought, word or action, I seek your forgiveness. 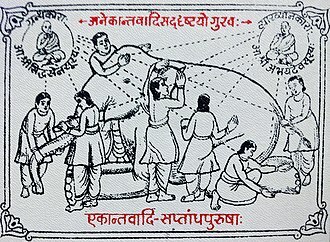 During the 8-day festival, the Śvētāmbaras Murtipujaka recite the Kalpa Sūtra, some Śvētāmbara Sthanakvasis recite the Antagada Sutra, which details the life of great men and women who attained moksha during the eras of Neminatha and Mahavira. During Paryushana, Jains observe a fast, the span of the fast can last from a day to 30 days or even more. At the conclusion of the festival, the Sravakas request each other for forgiveness for all offenses committed during the last year and this occurs on the Paryusha day for the Śvētāmbara and on Pratipada of Ashwin Krashna for the Digambara. Forgiveness is asked by saying Micchami Dukkadam or Uttam Kshama to each other and it means If I have caused you offence in any way, knowingly or unknowingly, in thought word or deed, I seek your forgiveness. 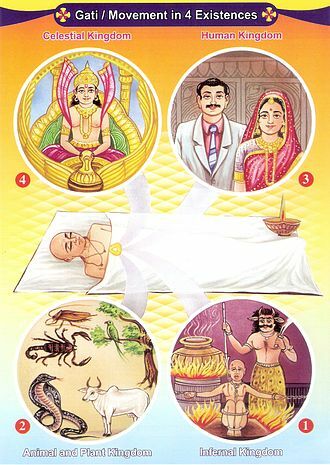 Das-Dharma are mentioned in the Jain text, Tattvartha Sutra and it may be undertaken during Shukla Panchami to Chaturdashi of Bhadrapada, Magh or Chaitra months. Ahimsā in Jainism is a fundamental principle forming the cornerstone of its ethics and doctrine. The term ahimsa means nonviolence, non-injury or absence of desire to harm any life forms and other nonviolent practices and rituals of Jains flow from the principle of ahimsa. The Jain concept of ahimsa is very different from the concept of found in other philosophies. Violence is usually associated with causing harm to others, but according to the Jain philosophy, violence refers primarily to injuring ones own self – behaviour which inhibits the souls own ability to attain moksha. At the same time it means violence to others because it is this tendency to harm others that ultimately harms ones own soul. 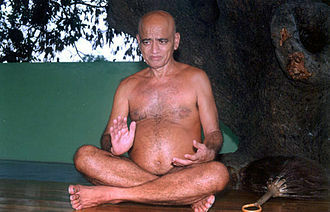 Furthermore, the Jains extend the concept of not only to humans but to all animals, micro-organisms. All life is sacred and everyone has a right to live fearlessly to its maximum potential, the living beings do not have any fear from those who have taken the vow of ahimsa. According to Jainism, protection of life, known as abhayadānam, is the charity that a person can make. Ahimsa does not merely indicate absence of violence, but indicates absence of desire to indulge in any sort of violence. Jains have strongly advocated vegetarianism and nonviolence throughout the ages, Ahimsa being central to the Jain philosophy, Jain Ācāryas have produced, through ages, quite elaborate and detailed doctrinal materials concerning its various aspects. According to Aidan Rankin, the concept of ahimsa is very much intertwined with Jainism, Jain texts expound that there are ten vitalities or life-principles, these are, the five senses, respiration, life-duration, the organ of speech, and the mind. Living beings are classified on the basis of their sensory organs, According to Jain texts, The one-sensed lives possess four vitalities – sense organ of touch, strength of body or energy and life-duration. The two-sensed beings have six, namely the sense of taste, the three-sensed beings have seven with the addition of the sense of smell. The four-sensed beings have eight with the addition of the sense of sight, the five- sensed beings without mind have nine life-principles with the addition of the sense of hearing. Mahavir Jayanti, known as Mahavir Janma Kalyanak, is the most important religious festival for Jains. It celebrates the birth of Mahavira, twenty-fourth and the last Tirthankara of Avasarpiṇī, on the Gregorian calendar, the holiday occurs either in March or April. Most modern historians consider Vasokund as Mahaviras birthplace, according to Jain texts, Mahavira was born on the thirteenth day of the bright half of the moon in the month of Chaitra in the year 599 BCE. 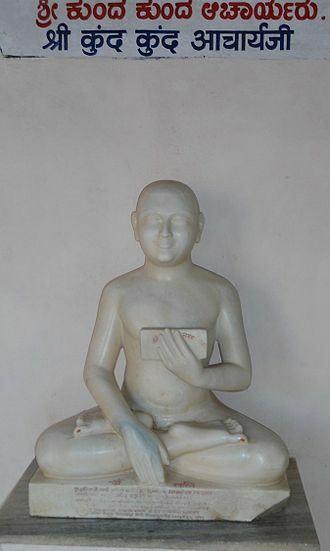 Mahavira was born in a kingdom, where the king was chosen by votes. As a child, Mahavira was called with the name Vardhamana, in Vasokund, Mahavira is much revered by the villagers. A place called Ahalya bhumi has not been ploughed for hundreds of years by the family that owns it, Mahavira was born into Ikshvaku dynasty as the son of King Siddhartha of Kundagrama and Queen Trishala. During her pregnancy, Trishala was believed to have had a number of auspicious dreams, the exact number of dreams differs according to the school of Jainism, Svetambaras generally believe that the actual number is fourteen while Digambaras claim sixteen instead. Regardless, the astrologers who interpreted these dreams claimed that the child would become either a Chakravartin or a Tirthankara, the idol of Mahavira is carried out on a chariot, in a procession called rath yatra. On the way bhajans are recited, local statues of Mahavira are given a ceremonial bath called the abhisheka. During the day, most members of the Jain community engage in some sort of charitable act, many devotees visit temples dedicated to Mahavira to meditate and offer prayers. Lectures by monks and nuns are held in temples to preach the path of virtue as defined by Jainism, donations are collected in order to promote charitable missions like saving cows from slaughter or helping to feed poor people. Ancient Jain temples across India typically see a high volume of practitioners come to pay their respects. Ahimsa runs and rallies preaching the Mahaviras message of Ahiṃsā are taken out on this day, many political leaders and government officials extend their greetings on this occasion. Rashtrakuta was a royal dynasty ruling large parts of the Indian Subcontinent between the sixth and 10th centuries. The earliest known Rashtrakuta inscription is a 7th-century copper plate grant detailing their rule from Manapura, other ruling Rashtrakuta clans from the same period mentioned in inscriptions were the kings of Achalapur and the rulers of Kannauj. Several controversies exist regarding the origin of these early Rashtrakutas, their native home and this clan came to be known as the Rashtrakutas of Manyakheta, rising to power in South India in 753. At the same time the Pala dynasty of Bengal and the Prathihara dynasty of Malwa were gaining force in eastern and northwestern India respectively, an Arabic text, Silsilat al-Tawarikh, called the Rashtrakutas one of the four principal empires of the world. The early kings of this dynasty were influenced by Hinduism and the kings by Jainism. During their rule, Jain mathematicians and scholars contributed important works in Kannada, Amoghavarsha I, the most famous king of this dynasty wrote Kavirajamarga, a landmark literary work in the Kannada language. Architecture reached a milestone in the Dravidian style, the finest example of which is seen in the Kailasanath Temple at Ellora in modern Maharashtra. Other important contributions are the Kashivishvanatha temple and the Jain Narayana temple at Pattadakal in modern Karnataka, the origin of the Rashtrakuta dynasty has been a controversial topic of Indian history. The relationship of these medieval Rashtrakutas to the most famous dynasty, the Rashtrakutas of Manyakheta, the sources for Rashtrakuta history include medieval inscriptions, ancient literature in the Pali language, contemporaneous literature in Sanskrit and Kannada and the notes of the Arab travellers. Scholars debate over which ethnic/linguistic groups can claim the early Rashtrakutas, possibilities include the north western ethnic groups of India, the Kannadiga, the Maratha, or the tribes from the Punjab region. Scholars however concur that the rulers of the dynasty in the 8th to 10th century made the Kannada language as important as Sanskrit. Rashtrakuta inscriptions use both Kannada and Sanskrit, and the rulers encouraged literature in both languages, the earliest existing Kannada literary writings are credited to their court poets and royalty. Though these Rashtrakutas were Kannadigas, they were conversant in a northern Deccan language as well, the heart of the Rashtrakuta empire included nearly all of Karnataka and parts of Andhra Pradesh, an area which the Rashtrakutas ruled for over two centuries. He helped his father-in-law, Pallava King Nandivarman regain Kanchi from the Chalukyas and defeated the Gurjaras of Malwa, dantidurgas successor Krishna I brought major portions of present-day Karnataka and Konkan under his control. During the rule of Dhruva Dharavarsha who took control in 780 and he led successful expeditions to Kannauj, the seat of northern Indian power where he defeated the Gurjara Pratiharas and the Palas of Bengal, gaining him fame and vast booty but not more territory. He brought the Eastern Chalukyas and Gangas of Talakad under his control, according to Altekar and Sen, the Rashtrakutas became a pan-India power during his rule. Tirthankara images at Siddhachal Caves inside Gwalior Fort. Statue of Emperor Bharata Chakravartin, after whom India was named Bharatvarsha . Artistic representation of a sculpture from the Mathura archaeological site (Kankali Tila) that depicts the last four Tirthankaras, c. 51 CE. Brass idol of Parshvanatha from the 8th century, Ethnological Museum of Berlin. Gandhi used the Jain concept of Anekantavada to explain his views.